Moen YB9824ORB Oil Rubbed Bronze Waterhill 24" Towel Bar. Moen pays close attention to detail when crafting and designing their bathroom accessories. These Moen Accessories are innovations that make your everyday activities simpler, and create a perfectly coordinated bathroom. The intricate charm of the Waterhill collection will instantly add character to your home. A range of products provide all the design features necessary to enrich your space. This Moen YB9824ORB Oil Rubbed Bronze Waterhill 24" Towel Bar is designed to mount on the bathroom wall and keep multiple large or small towels off the floor and counter space, saving you space and keeping your bathroom clutter free and organized. 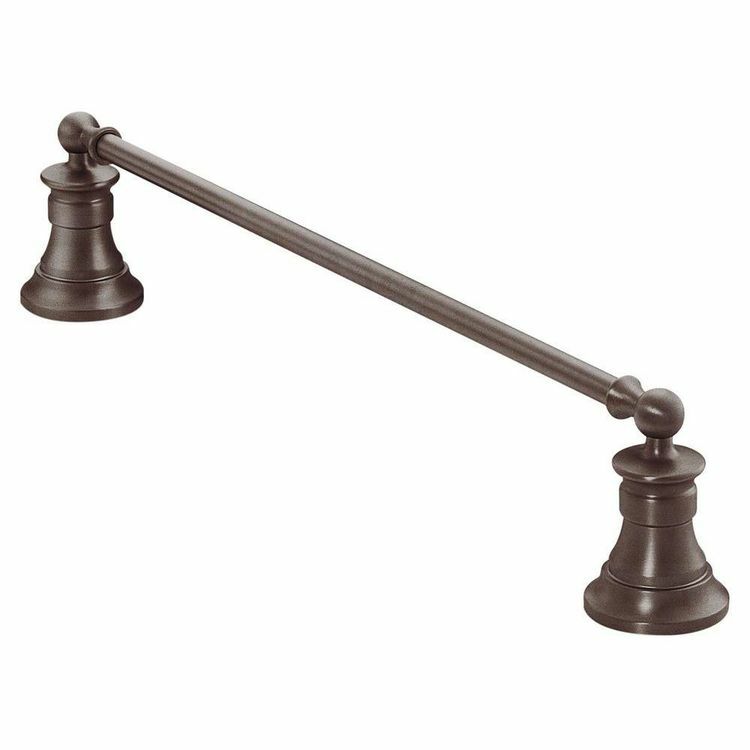 This Elegant Transitional Towel Bar has an elegant oil rubbed bronze finish. Shipping Dimensions 4.6" x 2.9" x 22.8"
The bar itself is only 22" compared to competing products with 24" bars so you can not hang two towels side-by-side which would be the purpose of this product. Not sure how Moen did not think this through. Also the bar itself seems a bit light and skinny for towels unlike the quality built into other Waterhill products. Hopefully Moen will reengineer the product so that 2 towels can hang side by side comfortably with a solid bar for support.